Step 1: Decide to learn to play. Deciding to start learning to play an instrument can be as simple as picking one up somewhere, perhaps at a friend’s house, and playing it. The music you create might not sound great to you right away, but in fact, you are already learning that instrument. Step 2: Get an instrument. Buy or borrow one that is attractive to you and within your budget. Step 3: Find a nice place in the house for your instrument. Store it where you spend your leisure time, or someplace where you’re going to see it often during your day. 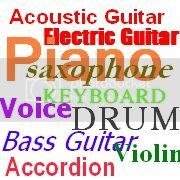 The more accessible your instrument, the more you will pick it up and play it. Eventually you’ll be picking it up every free minute you have. Step 4: Listen for the sounds that you like. Experiment, focusing on a few notes or rhythms that interest you. When you do something you like, do it again and try to remember it for next time. In the beginning, it’s all really this simple! Step 5: Learn the basics of music theory. Step 6: Take lessons if you think you should. While you’ll likely learn technique faster from a teacher than on your own, it is you, yourself who must find your own self expression. Step 7: Practice playing in time. Find a beat off of which to work: there are free metronomes online. A ticking clock or the radio will function well for you too. Even if you’re more interested in playing out of time or experimenting with odd times, you should know how to relate music to time. Step 8: Play with a friend, it’s more fun. As well as helping you to stay in time, this will introduce you to new ways of playing. Step 9: Start a band. Collaboration with others will give you direction and motivation in your music. Step 10: Share your talents with others. Start now your in-home lessons.